We’d love your help. Let us know what’s wrong with this preview of Respect for Acting by Uta Hagen. To ask other readers questions about Respect for Acting, please sign up. This book turned the shy dreamer writer into the shy dreamer actor you see today! The "method" explained in understandable terms by a great acting teacher. She was my teacher and when I teach, I use this book as an important resource. If you are even considering being an actor, you should read this. A readable, well-organized guidebook. A wee bit pretentious, but I sure want to work hard now! This is one of those books that I wish I had read 10 years ago and yet I picked it up at the most appropriate time to guide me through figuring out the most difficult role I've had to play yet. Her chapter on emotion has been invaluable. She reprimands the "modern" actor so effectively too! (This book was written in the 70s, but everything is still perfectly usable. When it feels dated is in the language of the decade and then it only serves to endear me towards her more.) I loved getting a good This is one of those books that I wish I had read 10 years ago and yet I picked it up at the most appropriate time to guide me through figuring out the most difficult role I've had to play yet. Her chapter on emotion has been invaluable. She reprimands the "modern" actor so effectively too! (This book was written in the 70s, but everything is still perfectly usable. When it feels dated is in the language of the decade and then it only serves to endear me towards her more.) I loved getting a good scolding from Uta. She knows actors so well, our tricks, our excuses, our bad habits. Ugh. Thank you. I needed to be yelled at and knocked down a few notches. This book makes me want to go back to school and learn with her, though some of her exercises I think would make me go absolutely crazy. I immediately want to start reading it again and take better notes this time. Maybe I'll read this book every time I start rehearsal for a new play. I guess I must read her next book too. Uta Hagen is my new hero. I had to read this over the summer because my acting coach recommended it to all of her students. I really enjoyed the beginning, and by beginning I mean the first chapter, but other then that I did not. I feel that she speaks as her word is fact. "We MUST," and "After that we HAVE to." I just feel that it's her opinion and interesting as it is, it's just her OPINION! I feel that when she goes into her processes she becomes one of those teachers you hated having in school where they t 2.5 stars. I had to read this over the summer because my acting coach recommended it to all of her students. I really enjoyed the beginning, and by beginning I mean the first chapter, but other then that I did not. I feel that she speaks as her word is fact. "We MUST," and "After that we HAVE to." I just feel that it's her opinion and interesting as it is, it's just her OPINION! I feel that when she goes into her processes she becomes one of those teachers you hated having in school where they thought they were always right because they've had more experience than you. Good basic instructions on acting technique from one of Broadway's leading actresses. Ms. Hagen is noted for her "Nine Questions" exercise in defining one's character. Many of the directors I've worked with assign this exercise as preparation for a role. Reading about the exercise from the source and seeing how Ms. Hagen developed and refined this exercise in her own career is invaluable. I'm sure I'll come back to this book time and time again. In my opinion, to make it short and sweet, this is the best damn book EVER written on acting. Uta = goddess of acting. Her other book is equally as good, and perhaps a bit more polished since it was written later in her life, but this one was the foundation of all her teachings at the HB Studio in NYC. Read it and weep, actors! This is a great book for those serious about acting. Uta Hagen offers an in-depth perspective on how to deepen the connection between the actor and the stage, other actors, and their craft. The book includes excercises the actor can perform on their own or with others. Really interesting take on the process of acting--I will definitely have to reread, it was a pretty information heavy book. Uta Hagen has some good advice. I can't say this was a page-turner, but if you're in the craft, it's got some good bits of insight. For the actor who is serious about his or her craft, this is a well-written and inspiring self-help book. I categorize it as a self-help book because when an actor works on his craft, he is simultaneously getting to know himself on a new level. This is not the kind of book that sounds like the author spoke into a tape recorder for an hour. 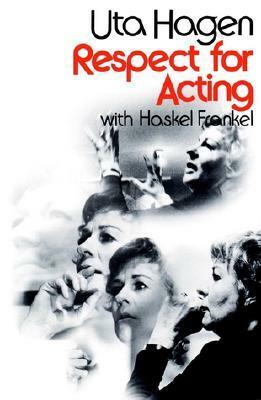 Split into three sections—The Actor, The Exercises, and The Role—Uta Hagen has obviously taken her decades of experience and carefully crafted her wisdom for For the actor who is serious about his or her craft, this is a well-written and inspiring self-help book. I categorize it as a self-help book because when an actor works on his craft, he is simultaneously getting to know himself on a new level. This is not the kind of book that sounds like the author spoke into a tape recorder for an hour. Split into three sections—The Actor, The Exercises, and The Role—Uta Hagen has obviously taken her decades of experience and carefully crafted her wisdom for aspiring actors. She helps her readers prepare mentally, physically, and verbally for their lifelong journey as an Actor. Readers will spend days, if not weeks, absorbing this first section, before moving onto the exercises in section two. In this second section, depending on the reader’s perspective, Hagen either connects with or loses her readers. There are several different types of actors; some might not be drawn to Hagen’s scene and character breakdowns. Personally, I was a less analytical actress in my heyday, but I still appreciated Hagen’s wisdom and helpful nature. In the third section, Hagen recommends how to approach a play, role, and scene, if and when you are lucky enough to have landed a part. Again, her approaches and breakdowns may be helpful to some readers, depending on the type of actor, of course. 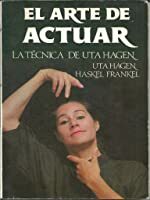 This is an incredibly thorough and wise read, and those who connect with her will be very grateful Ms. Hagen took her decades of experience on Broadway to help the next generation of actors and actresses. Uta was such a fascinating woman and a great acting teacher. In high school, I used to watch Uta Hagen's Acting Class in my own acting class and learned a lot from her scathing comments on scenes. Her book was no different, part memoir, part instructional handbook. Her style of realism and honesty in acting is what I strive towards. Very helpful and reflective to read and work with this semester. The undiluted raw opinions of this great teacher have immense value for an actor. Never settling for the cheap, for the cliche and respecting the craft are what she wanted for actors. The successor "A Challenge for the Actor" is a must read too, where she goes into much detail in explaining her techniques. This is a wonderful book on acting that I have read so far and I am glad that I did as it has helped me in my magic career. I highly recommend that anyone who is looking to improve their performance than this book is for you. The best book on acting that I, at least, have read. Uta Hagen is funny, accessible, and brilliant, and it’s great to have an acting book that blends exercises with philosophy. Would highly recommend to anyone interested in the performing arts, no matter their level of involvement. A fantastic resource and a must read for actors. So many new ideas, exercises and tips. Can't wait to use my new knowledge and re-read this again in the future! If you plan on acting anytime in the future, READ THIS BOOK! It is full of great exercises and advice. It is also set up in a digestible and concise fashion. An excellent classic on the art of acting. I really enjoyed the way Uta explained the preparation for the moment before you enter a scene or on stage! This is the rating of the book alone, as a book: not the author or her worth as a teacher. Uta Hagen was a celebrated actor and a beloved teacher based at the HB Studio in New York for a long time. This is the first of her two books, and ironically her best known although two decades after writing this one she wrote a second book, A Challenge For The Actor, with more emphasis on action as the expression of the character. For its time (early 1970s) the book is a bold statement about the artistry This is the rating of the book alone, as a book: not the author or her worth as a teacher. Uta Hagen was a celebrated actor and a beloved teacher based at the HB Studio in New York for a long time. This is the first of her two books, and ironically her best known although two decades after writing this one she wrote a second book, A Challenge For The Actor, with more emphasis on action as the expression of the character. For its time (early 1970s) the book is a bold statement about the artistry of acting, and most helpful (perhaps still) in an era when many acting teachers were delving into psychological realms with a misguided overemphasis on emotional crisis as the basis for creative work: "I am frankly fearful of those who profess to teach acting while plunging into areas of actors' lives that do not belong on a stage or in a classroom." On its own, the book offers good inspirational material on the proper ethics and attitude of an actor towards the craft, with some practical guidance on certain skills relevant to preparing a role. Considering the doldrums American acting is in, and the dire position of American theatre in the early 21st century, we might need some beloved actors to write us new statements asserting the worth and describing the discipline necessary for what we do, as well as why it is worth doing. But that is a topic of its own. Respect for Acting by Uta Hagen. An amazingly helpful book that by the end, will make you have respect for acting. When most people think of acting they think of costumes, stage, makeup, Shakespeare, etc. But Uta Hagen takes you on a thrilling adventure and shows you that there is more to acting than memorizing lines, and standing on stage reciting them. There is so much depth to acting that you would miss if you did not read this book. For example, Characterization, she talked about how acting Respect for Acting by Uta Hagen. An amazingly helpful book that by the end, will make you have respect for acting. When most people think of acting they think of costumes, stage, makeup, Shakespeare, etc. But Uta Hagen takes you on a thrilling adventure and shows you that there is more to acting than memorizing lines, and standing on stage reciting them. There is so much depth to acting that you would miss if you did not read this book. For example, Characterization, she talked about how acting is not just going on stage and making weird faces and reciting lines. You need to become your character that you're portraying. First you have to know a lot about your the person you are portraying and finding out everything about your character. This does take a lot of homework but it does pay off in performance when you finally get to completely become the character. Another one was setting, she talked about creating a fourth wall on stage that you could use as your setting. For example if you were outside and talking out to the hills, to imagine mountains and trees and rivers. Instead of thinking of the audience, that way you can completely become your character. Overall, this book was amazing and i highly recommend it to anyone who is interested in acting or just wants to know more about it. It is a very well written book and it will help you a lot as it did me.